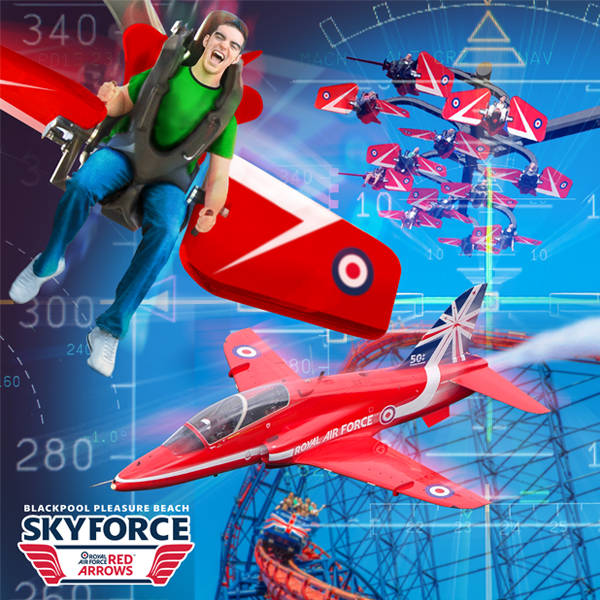 Blackpool Pleasure Beach have joined forces with the world famous Royal Air Force Aerobatic Team, the Red Arrows, to launch a unique thrill ride which will take excitement sky-high! Blackpool Pleasure Beach will become the world’s first tourist attraction to have a ride based on the planet’s best aerobatic display team. Preparing for deployment in the Spring, the ride’s aircraft will provide an exhilarating experience like no other! Loved across the planet for their jaw-dropping displays which have thrilled millions, the pride of the Royal Air Force will now be represented at the UK’s number one amusement park in a unique partnership where the rider takes control of their own plane to become a master of the skies. Despite it only having a capacity of 12 riders per cycle, I think this is still a good new investment for the park. I've seen this type of ride before and it does look brilliant. Just gives more reason to head back there next year at some point. The low capacity will be a big problem though since it will mean giant queues on a busy day.